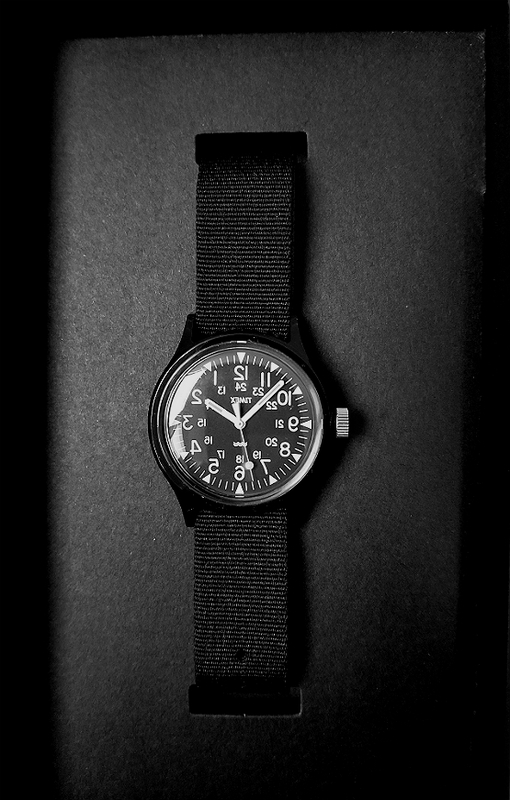 Japanese Timex x Beams Boy x Engineered Garments black case Camper watch resin / plastic black case. Hi again! This is Alan (email). 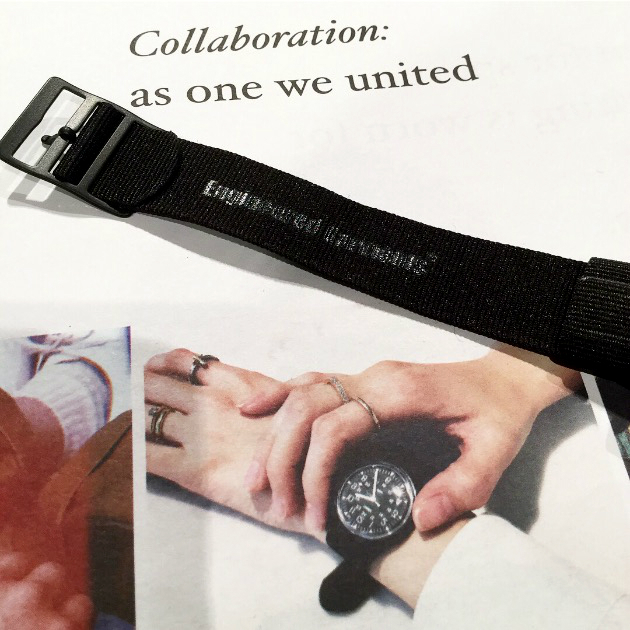 Presented and reviewed here is a new watch from TIMEX Japan, another collaboration with Engineered Garments and BEAMS BOY. 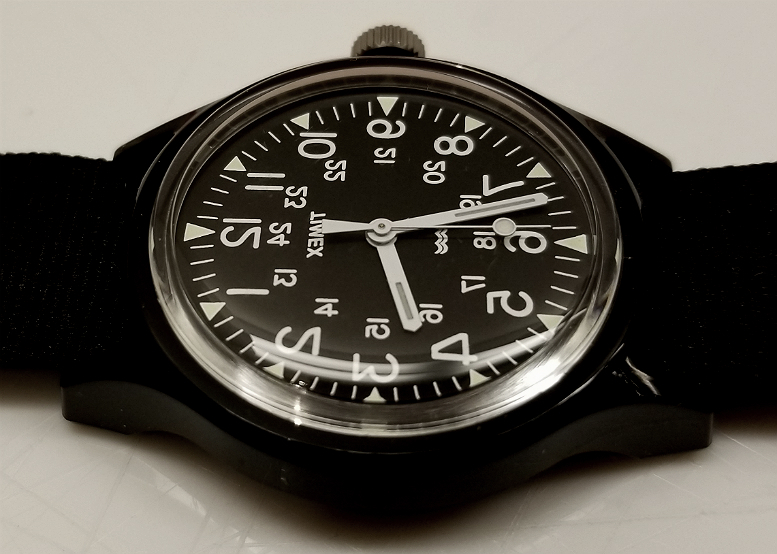 This is the fourth in this triple-collaboration series of watches, based on the 2015 "Original Camper" base model case, and a "modified" dial design, This version has a black resin (plastic) case and an acrylic crystal. The first two in this series also had resin cases. Green/olive, (March 25, 2016) followed by navy blue (April 28, 2016). 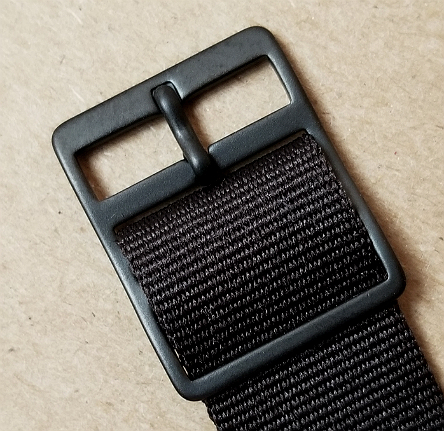 The third 3x collaboration was in stainless steel, which became available January 29th, 2018* The fourth, this black resin case watch became available March 23, 2018. 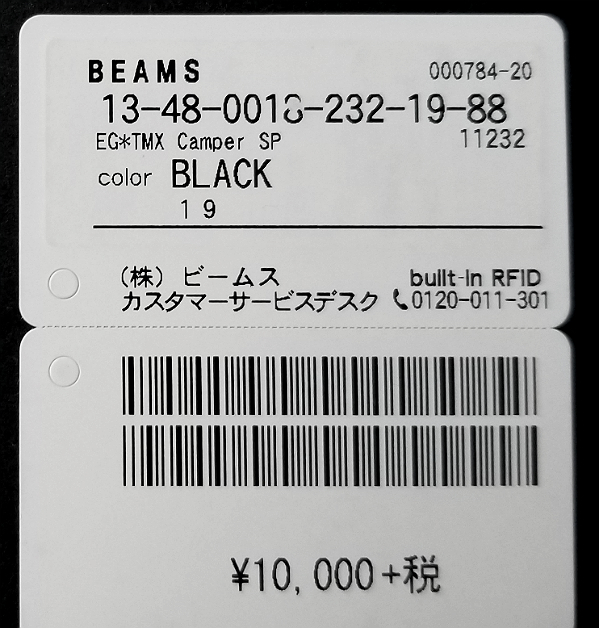 None of these have been not sold formally through Timex Japan, but were available exclusively through Beams, and Engineered Garments, retailing at for ¥10,800, including tax for the resin case, and ¥21,600 for the steel case. As with some of my other reviews, I will try to be complete, but my order of presentation of details may not always seem straightforward or highly ordered! I am grateful to those from whom I learned of these watches, and for the help of a friend in Japan who obtained it, and sent it to me in the US. Before my own description, let me copy the machine translation from the sales site, with the usual inherent imperfections of machine translation. 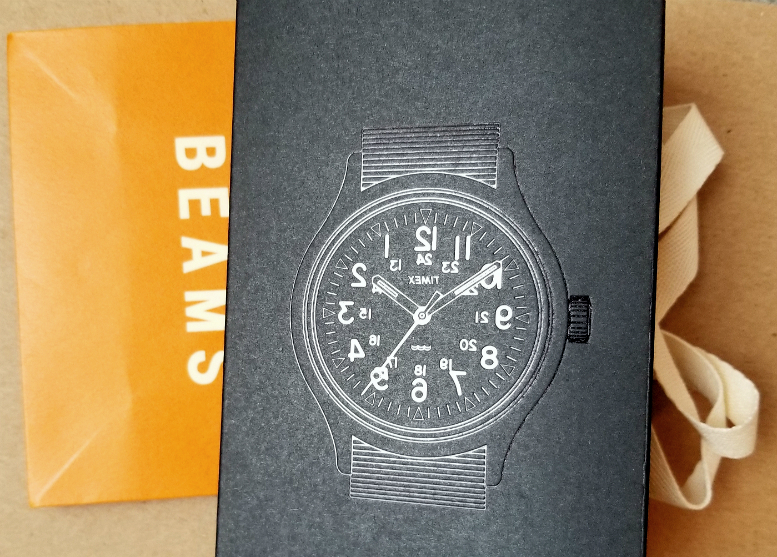 In commemoration of the 20th anniversary of the birth of <BEAMS BOY (BEAMS BOY)>, the second version of the special watch reprint model of <Engineered Garments (Engineered Garments)> and <TIMEX (Timex)> that sold out in the blink of an eye appeared in commemoration in a blink of an eye. While "ORIGINAL CAMPER" is based on dial design and logo mirror reversal, the needle is a normal clockwise, valuable wrist watch finished in a playful design full of <ENGINEERED GARMENTS>. 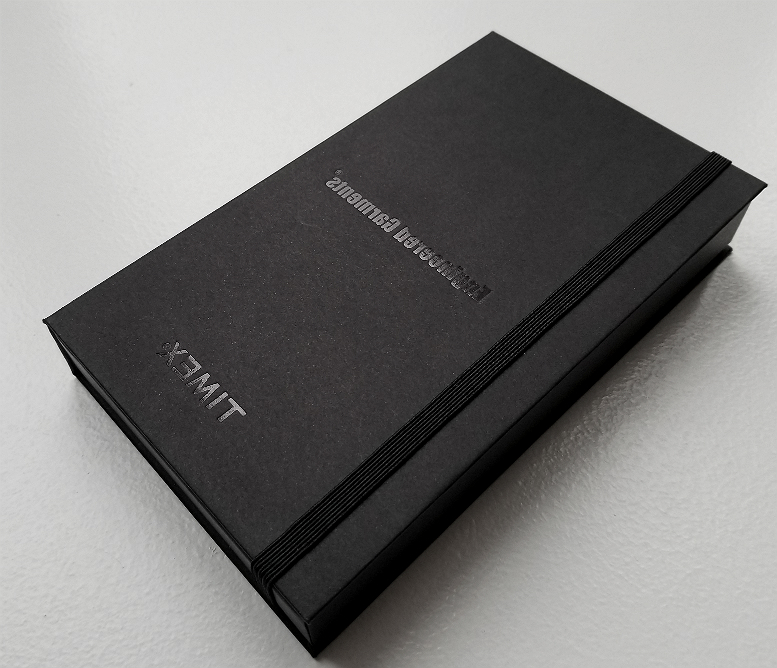 This time we prepared a black color with a reputation for <TIMEX (Timex)>. It is a point not to be missed a box of special spec according to the body color. Above, the presentation box. Ordinarily, I am not that much impressed with boxes and packaging. But I find the box design for this series of watches to be quite attractive and appealing, in particular with this black version. I will probably show more pictures of the package design here than I normally would. 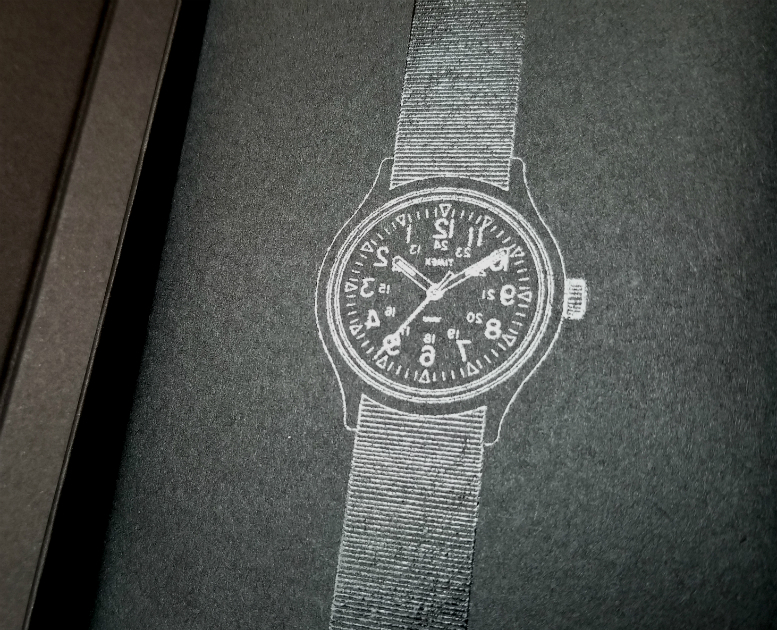 ​Below, the watch as it's held in place as you open the box. Quite a lovely and almost dramatic presentation, isn't it? 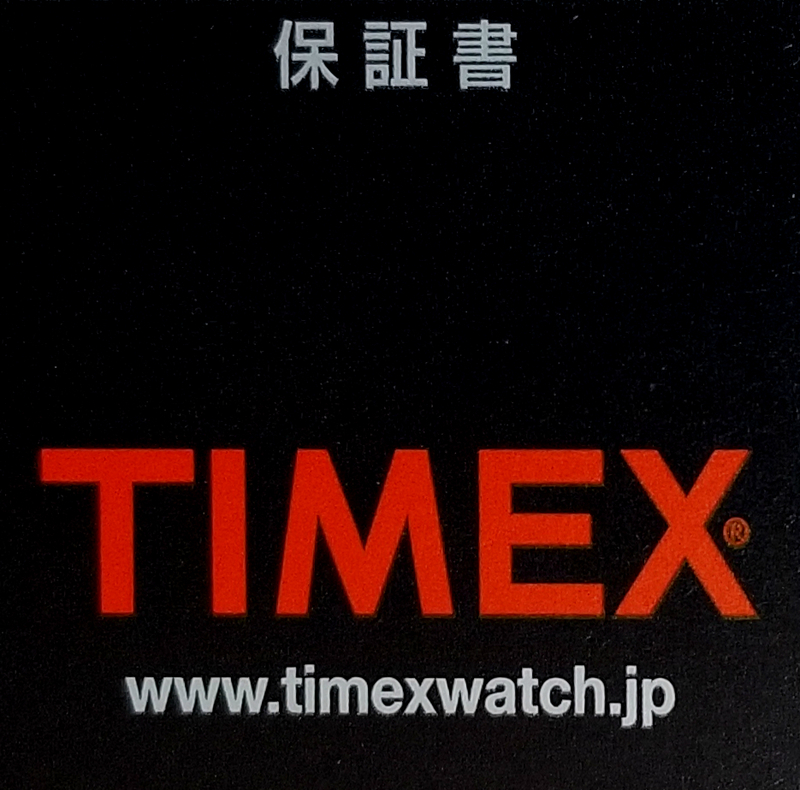 The dial, if you have not noticed by now, is reverse of the usual Japan Timex Camper model. 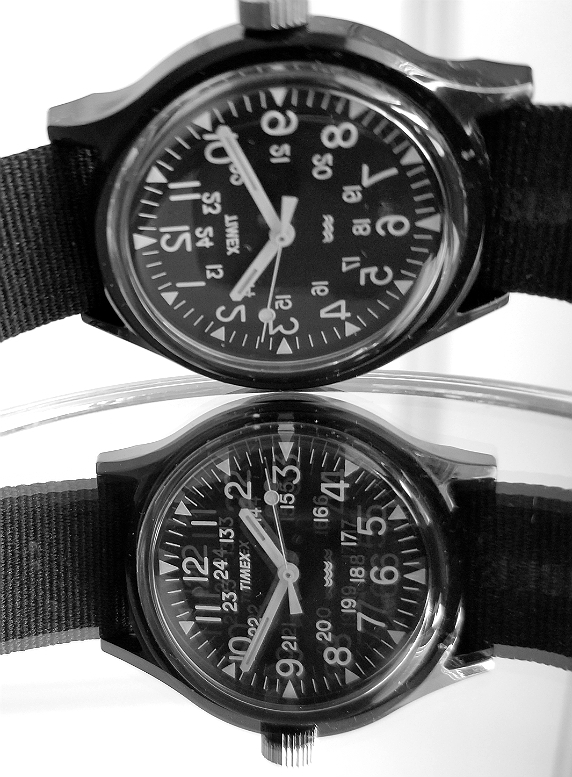 The 1-12, and 13-24 hours, along with the TIMEX logo are a mirror image of the original. More on the origin of this below, but it has direct inspiration from an American "barber shop clock" from around 1910. 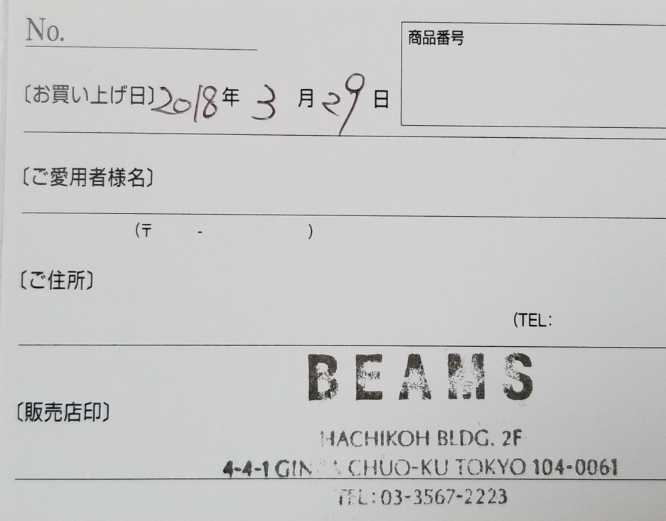 Below, warranty card from the Beams store in Ginza, Tokyo, purchased March 29, 2018. Photo showing the light-activating luminous material on the hands, and dial. Notice that the triangle hour markers are slightly larger at 12, 9, 6, and 3. This photo was taken immediately after shining a bright LED flashlight on the dial, turning off the light, and then immediately taking the picture. It's a real picture, but probably does not represent day-to-day reality of the watch, as the endurance of the luminous intensity is modest, and the experiment which led to this photo was not really real-world conditions. For example, if you're suddenly in a dark place, before your pupils have dark accommodated, it's unlikely you'll be able to tell time easily. At least that's what I've found. 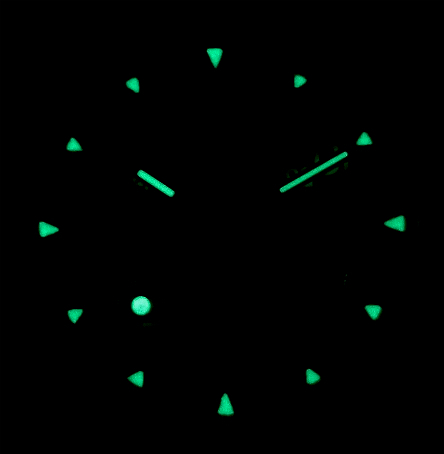 If you wear the watch to sleep, and happen to look at your watch in a very dark room after your pupils have had a chance to dilate and provide dark accommodation, then you can see the glow, but it is kind of faint. Probably my only suggestion to improve these watches would be to use a better quality luminous material, one with better efficiency of photon capture and/or persistence of luminescence. 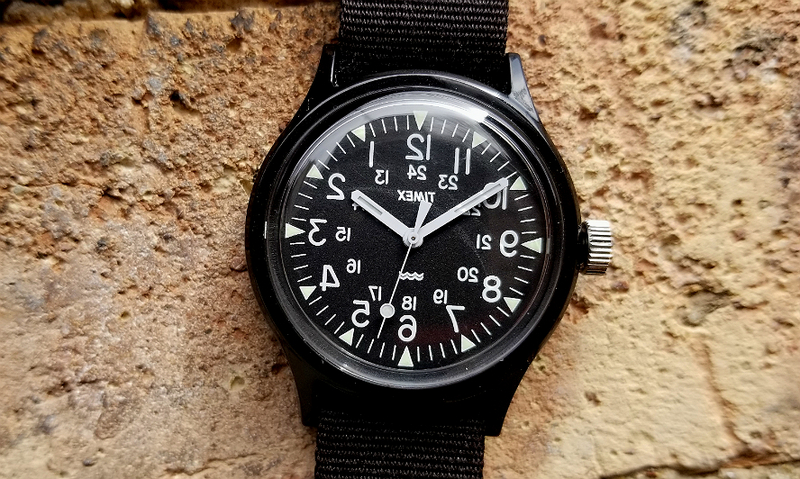 The 36 mm case is the classic fixed lug case of the now legendary "Original Camper," which was brought back as a TIMEX Japan project in November 2015, following a 20 year hiatus of production. 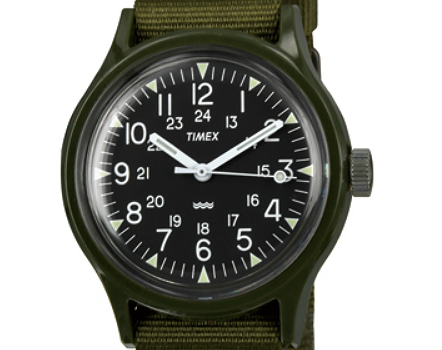 The first 1980s-1990s Campers were based on a very rare 1981-1982 Timex that was made in very limited quantities (100? 200?) as part of a potential government contract, that appears to have not materialized as a full-scale production contract watch. There is considerable mystique surrounding this rare Timex, and much is written about it elsewhere, for example here. Here is my review of three mechanical Campers 1980s-1990s. 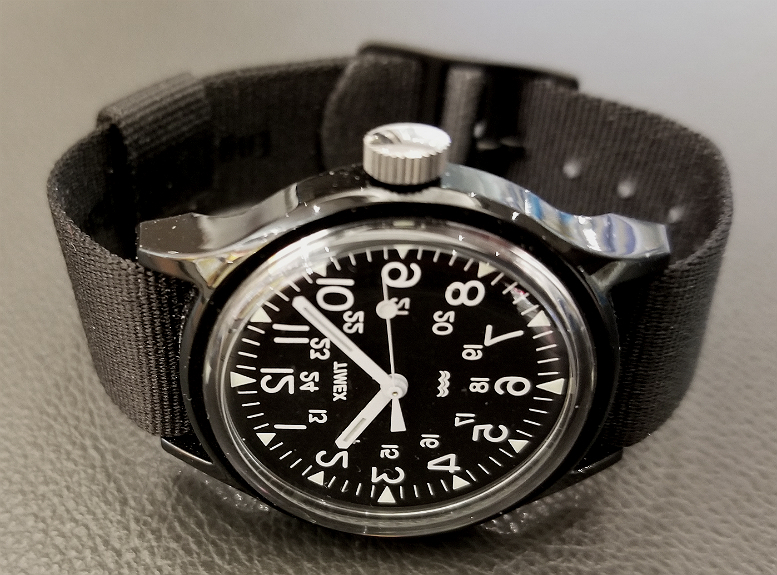 My feelings are that Timex was competing for a government/military contract, among a field of other watch manufactures, and made these few watches as samples or prototypes for testing and/or promotional purposes. Either Timex was never awarded the contract, or maybe they were awarded the contract but did not pursue it, for whatever reason. Who knows. 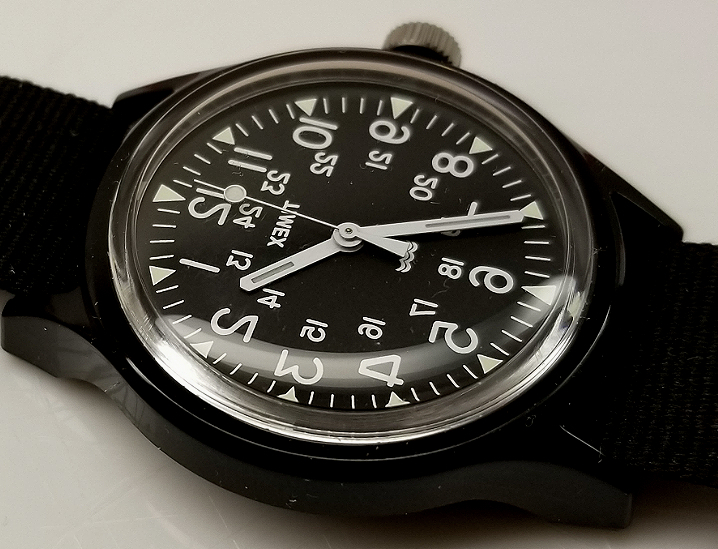 It's worth knowing that Timex was winding down (haha) production of mechanical watches in 1982, and it's possible that it was either 1) not worth it to them, or 2) not technically feasible to fulfill a such large military contract using mechanical movements, if they were phasing them out. But who really knows... NOTE: more info on this here. 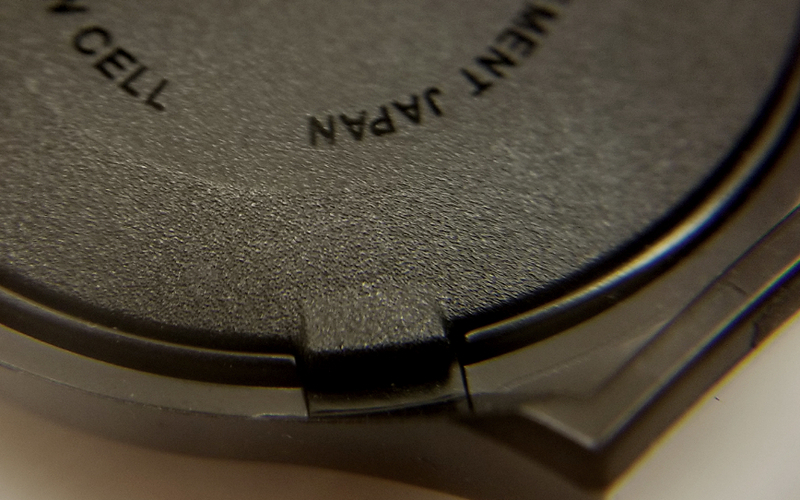 Check out the nice tab at the edge of the caseback, for lifting if off with a tool. 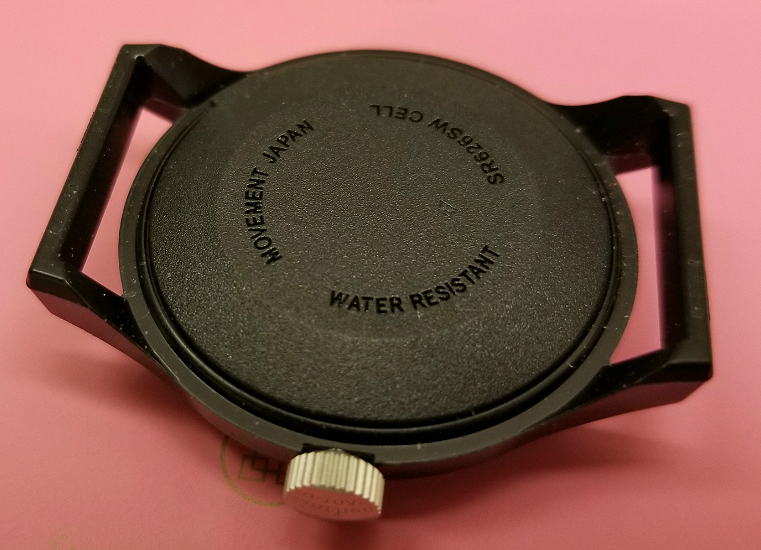 The caseback must be made of a very durable resin material to withstand this. 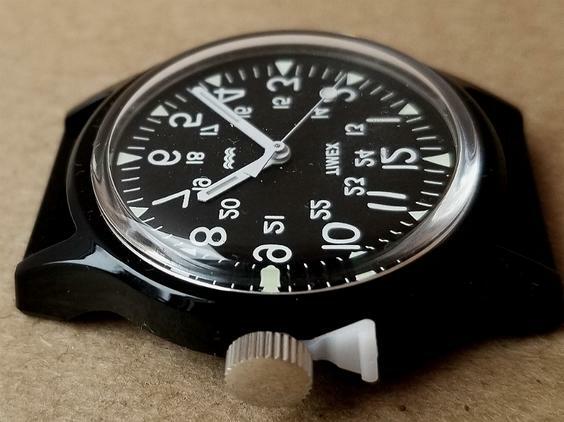 When TIMEX Japan wanted to make the 1990s Camper, based on this 1980s military Timex, they found that Timex no longer had any technical drawings, or other details necessary to replicate the case design. So, they obtained one of these rare originals from 1980s, and 3D scanned it (I'm guessing using some kind of optical/laser scanning?) in order to create an exact 3D model of the case. Based on this, the Camper was created, faithfully modeled after the original specification. UPC code sticker on the box. ¥ 10,000 + tax. 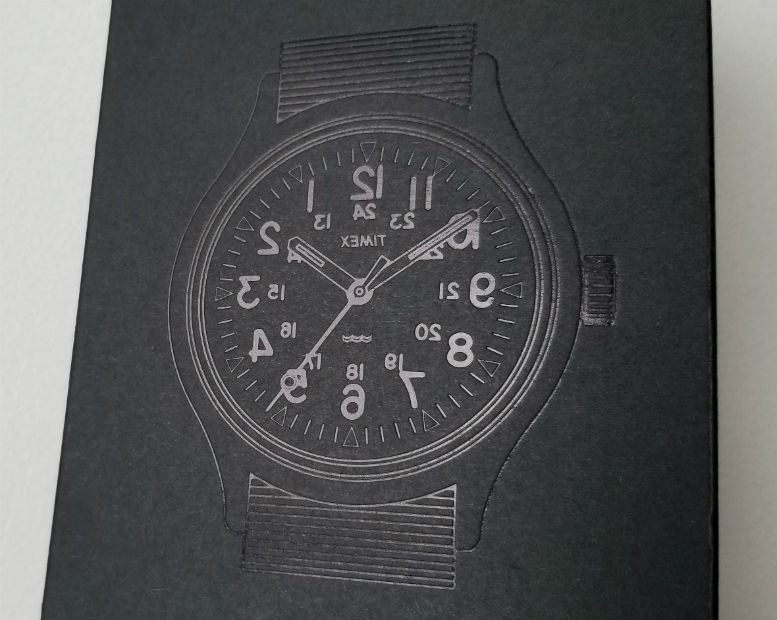 On one side of the outer presentation box, an embossed image of the watch is present, in a kind of black-on-black appearance. 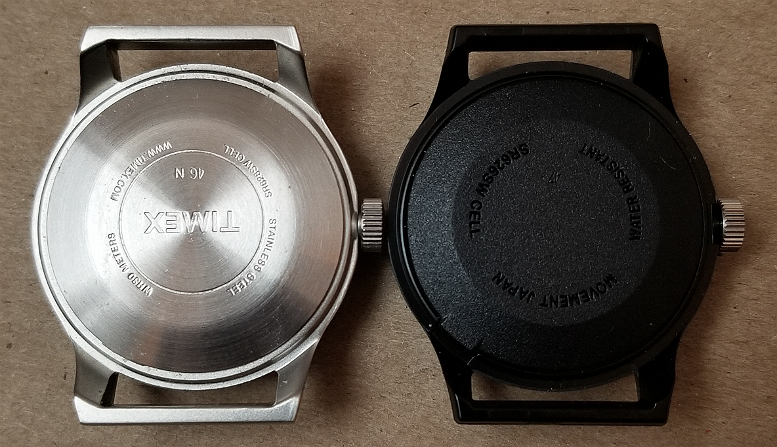 For comparison, next to it is the box for another in the BEAMS x TIMEX x EG series, the steel case mirror-dial Camper, identical aside from color. 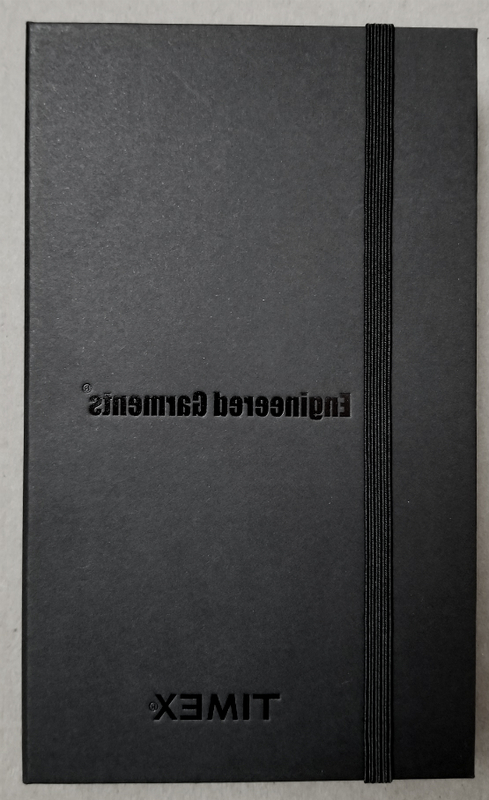 It is an appealing, minimal design. 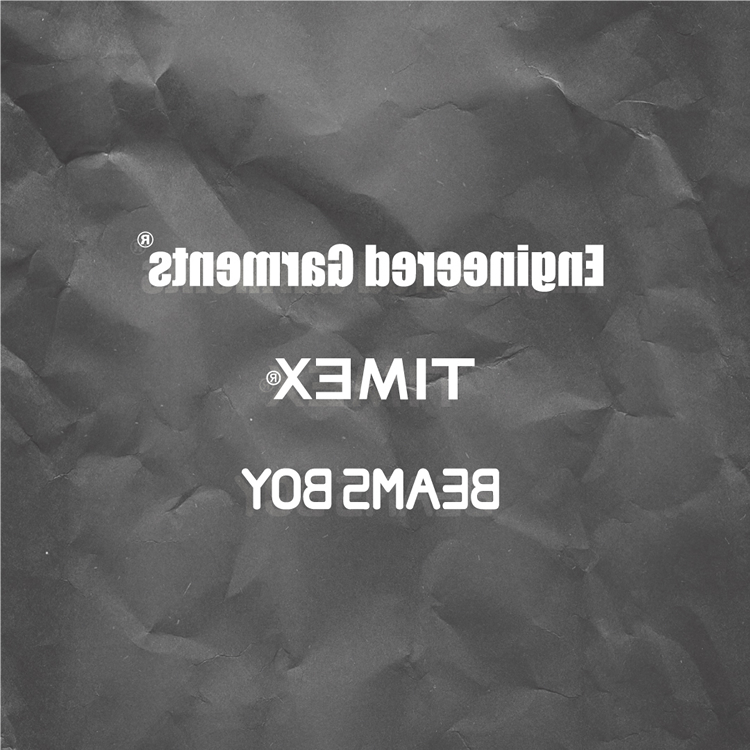 It's kind of fun how the black-on-black appearance is only such when you look at it en face, but when light lands on the image from an angle, you get a brilliant reflection, and it looks more white. Pretty cool. My two Campers, one on top of the other. Cases are identical. Crowns are identical size and shape. The steel case Camper has a more matte crown to match the steel case, and the resin case Camper has a more shiny crown. 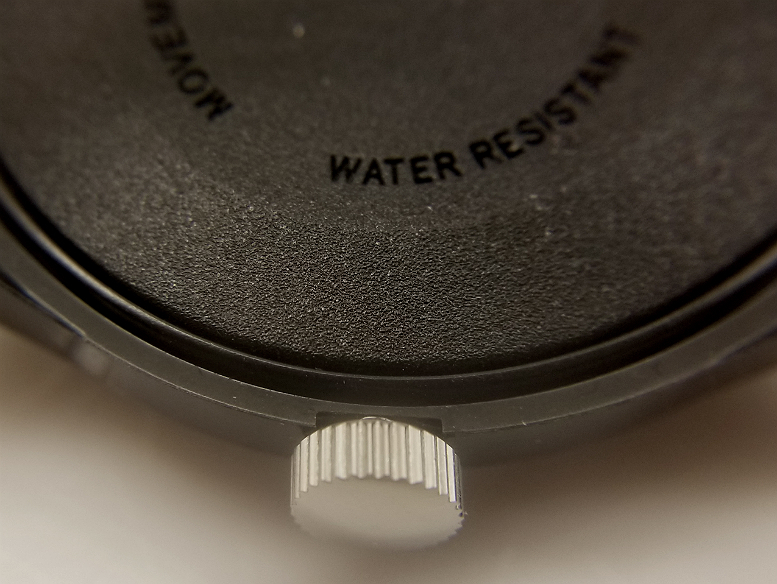 It also seems that the caseback of the steel Camper rises up just slightly more than that of the resin camper, less than a millimeter. This creative Instagram user has colored the crown on his watch black, with some kind of marking pen! Below, back views of the steel and the black resin Camper. But notice that in the same way the black graphics on the box can reflect white, when viewed at certain angles with respect to incident light, similarly the Engineered Garments signage has some shiny nature to it, and also reflects brightly to the light at an angle. The crystal is acrylic, and from this picture you can see it rises up from the edges of the case. The other previous resin case Campers in this series (green and navy blue, 2016) have had acrylic crystals, though the steel case Camper had mineral glass. Many people talk about how acrylic crystals have a more "warm" look, compared to glass, and I think this is probably from the fact that acrylic isn't totally colorless, but has a very subtle color, maybe like a G-J diamond. Glass is probably more close to colorless. Most people seem to know that acrylic crystals can scratch and even gouge easier than than glass, but with the proper materials and technique, these scratches can be buffed out to look nearly good as new. While mineral glass crystals, being made from a harder material, are less likely to scratch, but any scratch that does occur cannot generally be easily buffed out. Other differences: acrylic crystals can, over time (generally years and years) shrink, warp, become yellow and otherwise undergo deterioration, while the glass being essentially chemically inert, does not undergo such potential changes. I like both types of crystals, and appreciate the relative benefits. Regardless of crystal type, I do my best to avoid damage! Design and construction of the inner box. It really is a beautiful box. The graphic, like others, was in black, but looked white like this when turned to reflect incident light! It's a pleasing effect, and in some ways this play on light mimics in some way the irreverence of reverse dial. I have not enjoyed a box this much since I can't remember when. I mean, it is just a box. But it is really, really a great box. 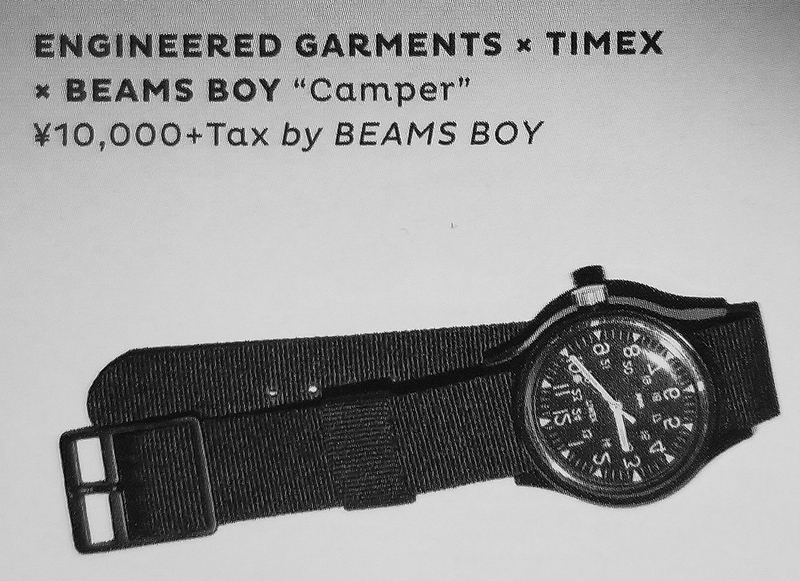 Marketing / promotional graphic for the Engineered Garments x TIMEX x BEAMS BOY black resin case Camper. Let's revisit the mirror image dial. 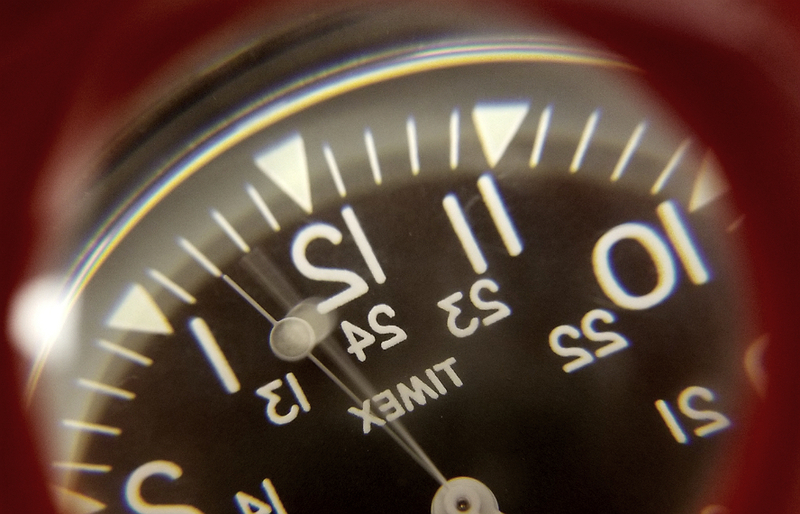 A complete reversal of the usual Camper dial. Including the TIMEX logo! Can you imagine Omega, Rolex, Seiko, or any other watch manufacture doing this, allowing their brand logo to look reversed? 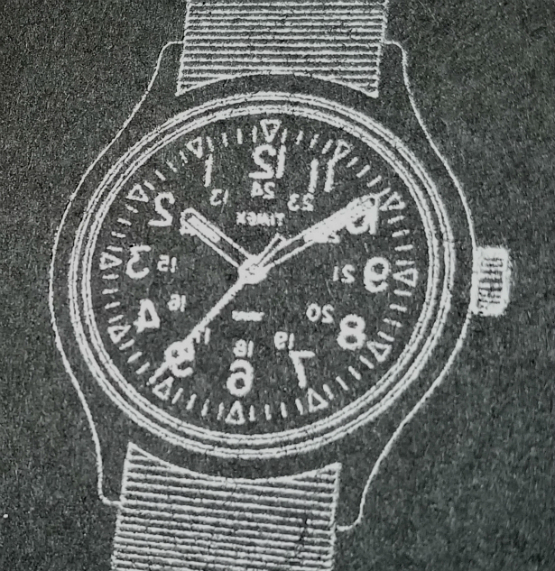 In fact, I really would not have imagined Timex doing this until I saw it! That old clock clock, from around 1910, had a mirror image dial, but also, unlike these Timex wristwatches which have a conventional forward-running movement, had a movement running in the reverse direction! This old clock was not meant to be whimsical, or playful in any way, as it served a purpose; the barber would hang the clock behind him, and while cutting the customer's hair, was able to tell the time while looking in the mirror. In the mirror, the apperance would of course be reversed, and therefore the displayed time would be correct. 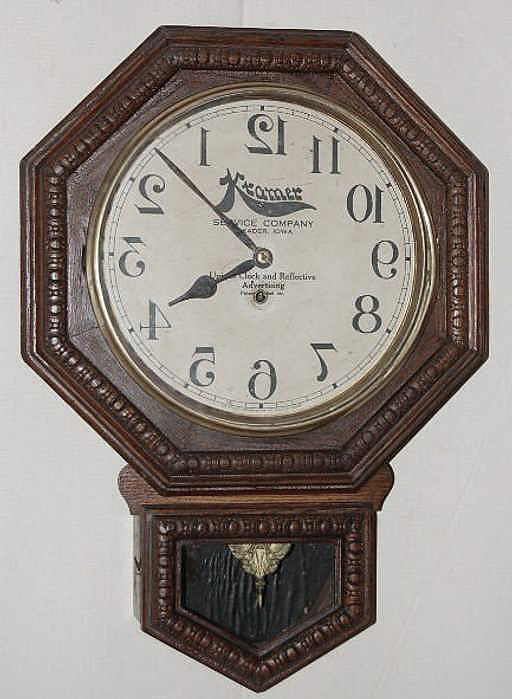 There are currently modern wall clocks like this. Here, a lady hangs it behind the mirror she uses to apply makeup. So, that's kind of a cool and seriously amazing history, that from this old, serious purpose-driven clock, an idea was born which lead to the playful, more whimsical, and well-received series of Timex x collaboration watches! 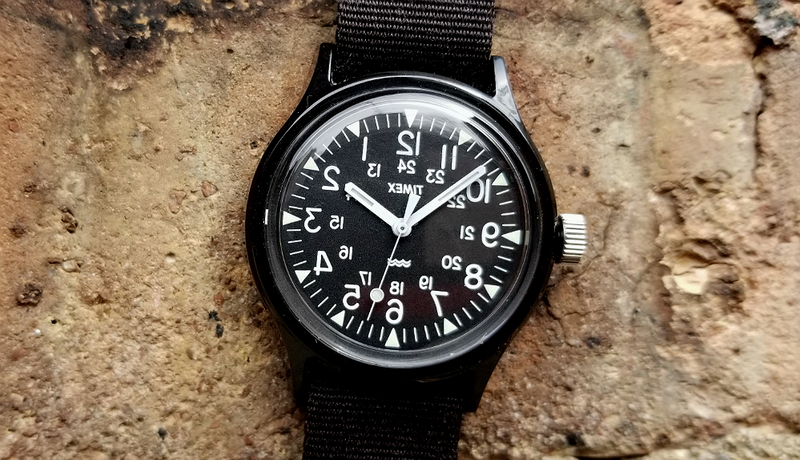 Thank you for reading, and I hope you have enjoyed my review of this Timex. The reverse dial is playful, and borders on absurdity, and these watches are clearly not for everyone. Their origin story -- the happenstance nature by which these watches were created, after a Timex rep from Japan came across an old reverse clock in an American museum, and hatched the idea for a mirror-dial wristwatch -- only makes them even more wonderful objects, imbued with history. 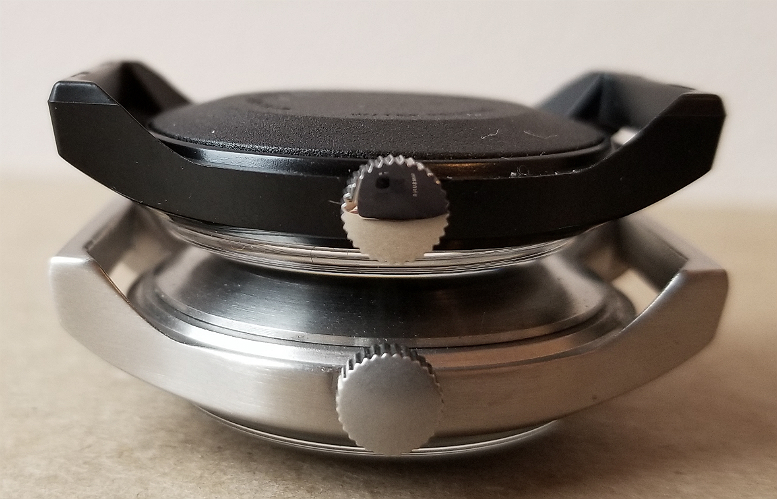 I showed the review of my steel case mirror-dial Camper on a watch discussion forum I had joined, and the people there generally thought it was a "stupid" idea, made no sense, etc, and at least one person said he thought my pictures were not real, and that I had Photoshopped them. I think these are the same people who believe in conspiracy theories. Anyway, nevermind that, these watches may not be for everyone, but they do have a lot of fans, and it appears to be a very successful series of watches. I love them! If anyone has thoughts, questions, more information, etc, feel free to contact me. You can email me. Slight differences between the mineral glass crystal on the steel Camper (left) compared with the acrylic crystal on the black resin Camper (right). Both crystals curve up from the edge, but you can see the mineral glass one curves a bit more and has a higher "dome" shape than that of the acrylic crystal; on the acrylic crystal, the curve nearly flattens out with a barely perceptible dome. Not great differences in shape, but I noticed it when I had them side-by-side. 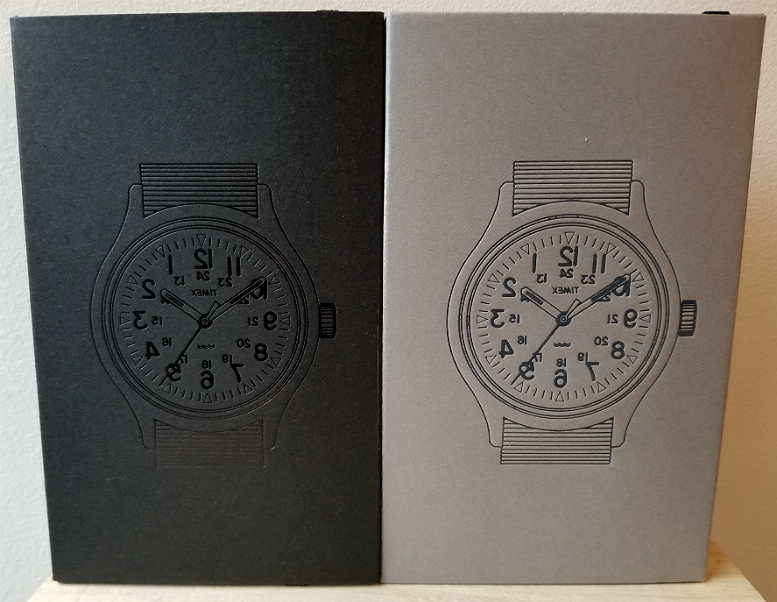 Also, the casebacks appear to be of very slightly different thicknesses, with the steel back appearing to be slightly thicker, as in the below picture. I'm not sure if it is some kind of visual fakeout, or if it is real, but I think it is probably real. Above and below pics from Beams SS18 catalog. 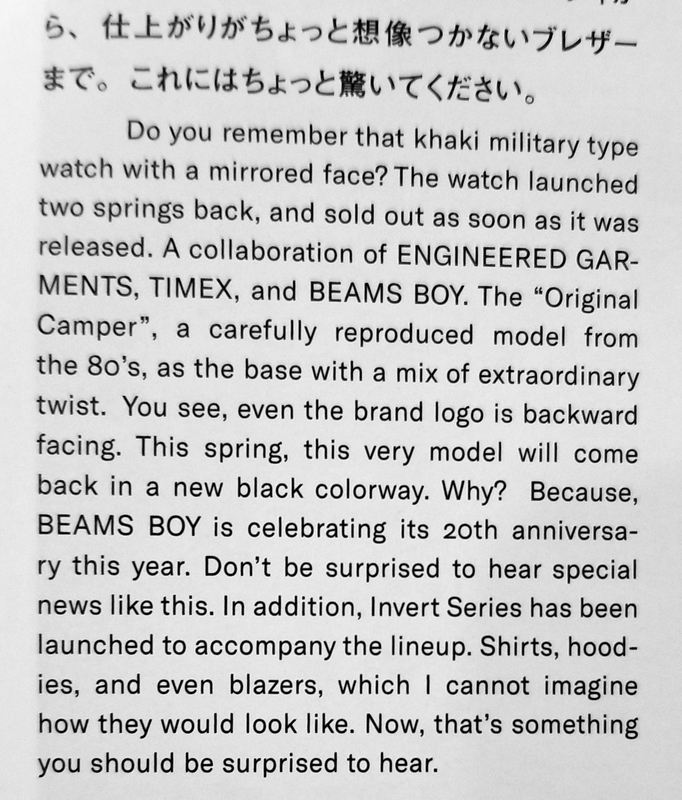 The texts also suggests a Beams clothing line "Invert Series" with reversed images?! Let's see the clothing line! 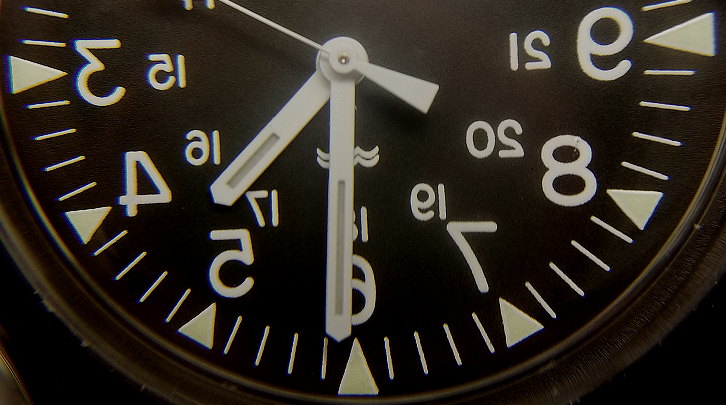 Dial detail. 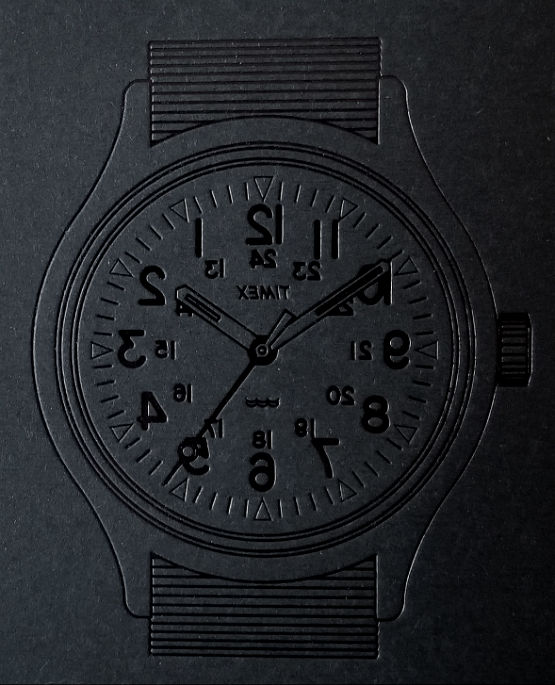 Notice the dial background is like a kind of finely granular matte black. 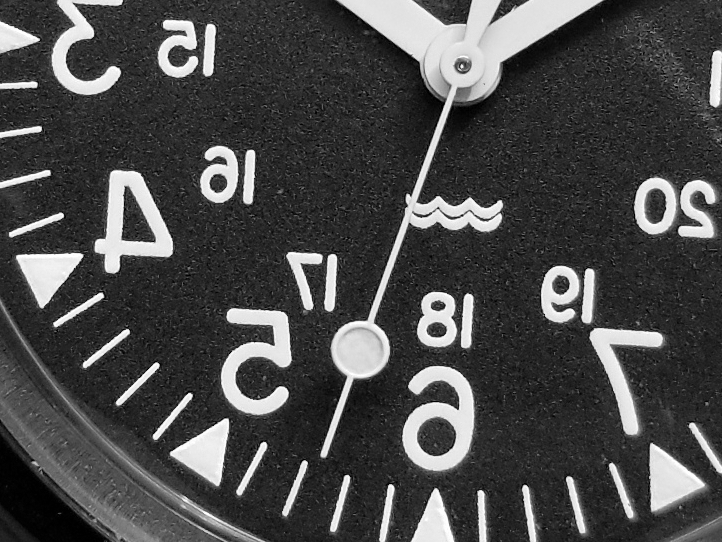 Also notice if you look carefully, the triangles have painted white background just like the other dial marks, but there is also a slightly smaller triangle of the luminous material applied over it.